Benjamin Franklin Commemorative Coins to Release in Jan 2006. The United States Mint hosted officials from the Franklin Institute and the Benjamin Franklin Tercentenary Commission on December 19, 2005. The reason for the gathering was the ceremonial striking of two new silver dollars celebrating the 300th anniversary of the birth of Benjamin Franklin in 1706. The Mint will offer the Benjamin Franklin Commemorative Coins in both proof and Uncirculated condition. 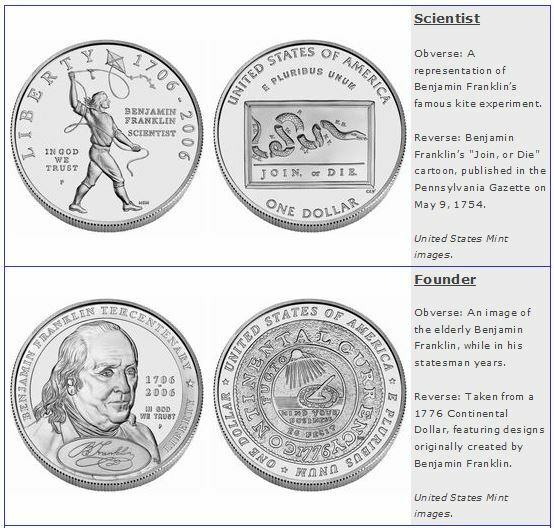 The first silver dollar, "Scientist," depicts on its obverse a view of a young Ben Franklin and his kite in the midst of a June 1752 experiment that led to a better understanding of electricity. The reverse design illustrates one of Franklin’s best-known political cartoons, entitled "Join, or Die", highlighted by a divided snake. The underlying message of the cartoon demonstrated Franklin’s strongly held opinion that colonial unity was vitally important. "Founding Father" is the theme of the second coin and recalls the elderly statesman profile of Benjamin Franklin. The reverse of the commemorative coin features a 1776 Continental Currency dollar, which carries designs originally created by Franklin. In general, the second commemorative silver dollar showcases the contributions made by Franklin in early American coinage and as a framer of the United States Constitution. The public started ordering the Benjamin Franklin Commemorative Coins on Franklin's birthday, January 17, 2006. Collectors can no longer obtain the coins directly from the Mint, but as always, there are many examples of the Benjamin Franklin Commemorative Coins available on eBay.